A line-up of new releases is set to cause chaos on the Shimano stand (#186) this year. Fortunately, this is not about the Shimano crew being disorganised, but a new range of rods, branded #KAOS, being releasing at the show. 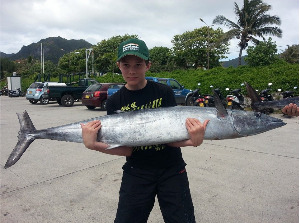 There are 12 rods in the line-up and they are all about lure fishing, be it for snapper, trevally, kahawai, snapper and salmon. Tony Orton has been field testing pre-production samples on his Offshore Adventures charter operation this summer and has given the range the thumbs up. The most noticeable feature is the distinctive lime green and burnt orange Winn grips which not only make the rods stand out in a crowd, but are practical in a fishing situation. The rods are manufactured on a Shimano T45 carbon blank with quality Fuji Alconite guides and a graphite reel seat. For more information, check out Sam Mossman’s review of these rods in the May issue of NZ Fishing News.